It is getting SO cold here in Atlanta. Our seasons swoop in like a hawk. First, it’s blistering hot. Then we have one or maybe two weeks of spectacular weather. Then we are freezing. 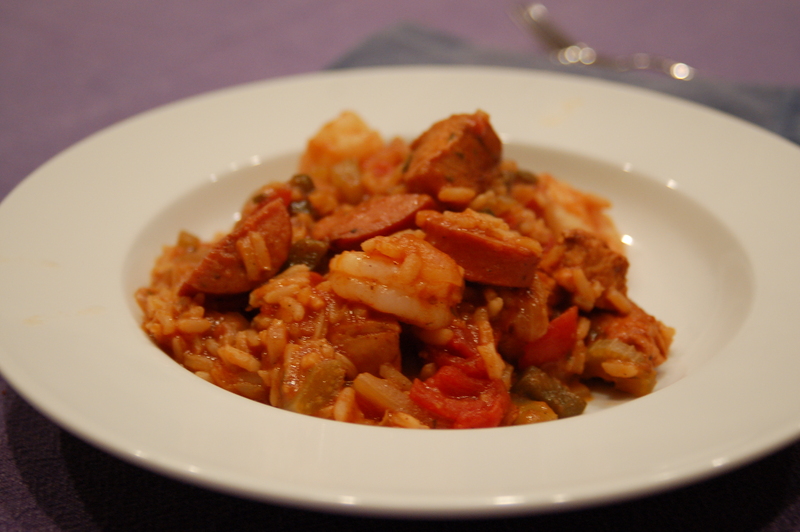 To combat the cold, Eric and I made a terrific and easy Jambalaya last night, adapted from Epicurious. Try it and you will have yummy leftovers for lunch! Add oil to a large nonstick saucepan. Over medium heat, sauté onion, garlic, poblano pepper and celery until onion is translucent. Add parsley, andouille, chicken, bay leaf, and cayenne pepper. Cook, stirring often, 5 to 6 minutes. Add tomatoes (with juice), tomato sauce, and 1 3/4 cups cold water. Gently simmer, uncovered, stirring occasionally, about 5 minutes. Pour rice into the pan and stir well. Bring mixture to a boil. Lower heat and simmer, covered, 45 minutes or until rice is cooked and absorbs most of the liquid. Stir in shrimp and cook 5 minutes more. Remove bay leaf. Season to taste with cayenne pepper and salt. Gobble up like mad hungry badgers and sit around the table smiling at each other! Posted in atlanta, cooking | Comments Off on Jambalaya Night! How wonderful to see you all – I have been very busy. I have always been interested in searching the great outdoors for dinner. Alack and alas, I don’t even camp. But I certainly love the idea of it. A group of friends started this cookbook club at the beginning of 2012 and invited Eric and me to join. I have been so busy, but you have been on my mind. What’s A Purloo? What’s A Syllabub? Posted in atlanta, Autumn, cocktails, cooking, Dessert, Entree, Hospitalityaholic, The Ritz-Carlton, Travel | Comments Off on What’s A Purloo? What’s A Syllabub? Rise and shine. We have a whole day of fun planned at The Ritz-Carlton, Charlotte. Join me for all the fun! Eric and I were just in Charlotte this weekend at The Ritz-Carlton and I cannot wait to share all the fabulousness we experienced. More on that later this week. If you just can’t wait – here’s a teaser. Charlotte is a gorgeous city and we were enchanted by it. I think you and your love of chocolate should indulge by taking a class at the Cocoa Lab and sending your kids to Cooking Camp while you are at the spa or shopping at the Epicentre across the street.